Even in the virtual worlds of games. There are people who focus on nothing but to swindle and steal their way to whatever they desire. It could be as simple as a piece of string to something as giant as a Titan spaceship. If it can be traded there are those out there looking to help themselves to it. Some games out there almost encourage it or at least from a policy standpoint don’t interfere as long as it’s only in-game items and not player accounts or worse. Others out there community is so trusting it is like the doors in an entire town have been left unlocked since no one steals. As such a whisper of doing such a thing would be game ending. Then you got games that deal with it when they have to. 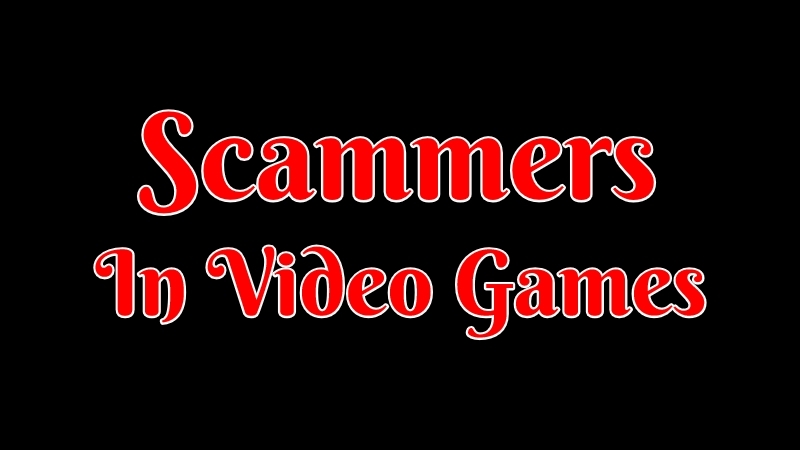 Here are a couple of stories of run-ins I’ve had with scammers over the years in games. For the longest time, this was the only game I was playing. From the moment you enter that game as a fresh rookie, your eyes should be peeled. Chances are that first person to spam invite you into a corporation is already looking to help himself. It not that everyone is so gung-ho to rob you blind and leave you with just your own rotting pod juice and nothing more. It’s just how that cold-hearted space of a game can be sometimes. Scammers come in all size of operations. From the lone wolf trying to get escalating permissions to corporation hangers to steal everything to entire alliances that are heavily known for being a little to open about how much they pillage and scam people. One of more reoccurring scams I noticed would go down in the biggest trading hub in the game called Jita. There you had everything from double your money, gambling, and contract scammers. Along with some fun adventures to be had as well as people are on the hunt for a sucker. You tend to see double your money scams in quite a few games and not just Eve Online. Most times they spam away trying to convenience people they were not a scammer. The usual was “I’m quitting the game and turning my life around. “ As such, it would be a big help to them if they gave away everything and had no longer a reason to return. You also had the ones telling people “try 100k first and watch it double to build trust.” 100k ISK (in-game currency) was nothing. Eve has ISK trillionaires after all. Heck, even I was a billionaire a few times. I would sometimes on an alt mess with them by going sure I’ll send you 100k and watch them send me back 200k. Yep, I was out right quick. Sometimes even then they did not double the first amount. I would just laugh as it was nothing but a couple of seconds to earn that much. Some of them were run by bots and others by humans. Another popular one was the contract scam. You could name the contact to whatever you liked so people would be claiming to sell a pirate ship or ten times the amount that is in the contract. Fools I assume would rush in on a deal too good to be true and way overpay for a non-pirate version of 1/10 the value. I don’t know anyone that was ever stupid enough to fall for this but sure enough, someone would be going off in system chat about getting scammed. Well, shoot that why you read the contract and what it contains inside first! Back in the day before you had fancy things like player owned citadels that allowed you to have a private hanger to keep your stuff safe. You had these giant bubbles in space around a tower with a bunch of modules hooked up to. This would include places to store ships, fittings, ammo, and loot to sell later on. Some friends and I joined a wormhole corporation and since there are no stations in wormholes (except for one) you had to live out of a POS. Everyone new would be put together in one POS where they all shared access to everyone’s ships and gear. You would just label your stuff hoping no one borrowed or steal it. After being in the corporation for so long you would be granted access and move your stuff to one of the many other POS’s that where set up. They cost money every week to keep them running so it was not something everyone would just have their own. One late night I’m out in one of my ships gathering materials off planets in our wormhole. I had some operations set up and was making an ok amount per week. One of the newer corporation members showed up on the same planet I was at in a combat ship and then vanished. I thought it was odd till two mins later a corporation that is known for piracy showed up and ganked my unarmed planetary ship and podded me. No big deal they were cheap and it was a long flight back to our current wormhole so I logged for the night. Woke up next morning and logged in with an email saying the new recruits POS has been robbed. Shoot I was out my site running and pvp ships worth around 1.4 billion. Worse of all the player who found me at the planet claimed I was the last one online so I must have robbed the corporation. Gee thanks we don’t even know each other yet. So they ask him where he was as well. He claimed to be at another trading hub buying ships to replace what he lost. Expect he was not. Maybe the guy did not know but higher roles in a corporation showed where the player was in the game. He was in another wormhole. That was known to be the home of the corporation that killed me. It did not take them long to work out the details of what really happened. Because planetary productions are run on a schedule and I’m all about keeping to my production schedule they worked out what night I would be out picking up my goods. So they waited for me to go out being the last one online and that is when that player went out to find what planet I was it. Guess he did not know how to scout. He then told his buddy where I was who ganked me. Thus ensuring the guy who was always online late at night was no longer a witness. He then went into the POS and jumped into each ship warping them off to a bookmark to where all his friends were waiting to haul them back to their own WH. It happened to be only a couple jumps away which is why they went for it. He had a few alts and was able to fly most of the ships. After that robbery, the corporation I was in refunded most of what people lost since they were quite well off. My group of friends and myself struck up a bargain for them to haul in our own POS and they would pick up some extra fuel to run it as well. They would just take out the cost every time their logistics team went off to sell what we had farmed. We never worried about getting our stuff stolen again. I’m just glad while I was still new to that corporation I had built up enough trust and had a history of being a decent person in the game. It also helps the guy right away lied about his location. That scammer could really mess up my reputation and made it hard to ever find a corporation again. As far as the scab bags they robbed one too many corporations and when someone found a way to their wormhole the location got shared. They got attacked and farmed quite a bit. All those accounts were burned as far as having any trust again. Since those players will forever have that corporation showing up in their history. I was in a higher end raiding guild most times getting server first kills. As such even if you were not in the inner circle with someone else most where like family. That is also where scammers get you with that buildup of trust. Back in the day, you had Dragon Kill Points (DKP) and it would take you months or sometimes a year before you bought an upgrade with it. It’s not like today’s games where the best loot in the game is raining like candy that spilled out of a broken jar. Stuff you wanted tended to only drop from one boss and most times it did not drop. With a few people wanting that same item as well. One guy who got tired of waiting around though up of a brilliant way to get all the gear he ever wanted. He faked his own death and between the lower quality of sound back then and messing with some settings he changed his voice up a bit. So he claimed to be the kid who just lost their dad but wanted to carry on the legacy of his character because it meant the world to him. So people ended up passing on loot that would be an upgrade once in a while. Till one night that person got a new microphone. People notice when a dead guy starts speaking in Ventrilo! Instant kicked and he tried to join another guild with his new spoils but the word had already spread. Most people are friends with other raiding guilds back in the day. So he paid for a server transfer to another realm and joined a guild that accepted him in. I think he lasted about a day before people found out and he was burned on that server as well. Word got back that he was then trying to sell the account on some shady site. Well, the reputation for that account and its characters were burned so all that fancy gear ended up being sold at a discount. As many higher end guilds who found out would not want anything to do with that account. The length people go to get gear in a game is just crazy. Almost as crazy as someone who thought they would get away with it. Even if that person did not mess up as he did. People were already noticing some rather fishy things about how exactly the same his behavior was among other things. So I doubt it would have gone on for much longer. It used to be rather rare to come across someone trying scam you in this game. Most times it was just an honest mistake and one party would catch an issue with the trade letting the other one know that’s not what was agreed on. However, times have changed as the game started to pick up more popularity. Ever since Blizzard shot themselves in the foot by telling the world that the next Diablo game would be on mobile angering the player base. They have been looking for something else to play. With how often people say Path of Exile is like how Diablo III should have been. It just makes the sense more people would play. Sadly with a bigger population just means more people trying to scam as well. I might have had one person trying to pull something funny on me once a league. In Synthesis league alone I’ve had half a dozen people try to scam in item trades. Path of Exile has no in-game market place to list items up for sale. To trade with other players you put an item up for sale in a special tab that then lists it to websites that are pulling that data. You then search and copy a comment to post in-game in what you want to buy. Then the two players meet mostly in the seller's Hideout and you do a manual trade. That is where things get fishy sometimes! Unlike a lot of other games where you might only be trading with people who all speak the same language. Trades are not limited by server or location. So some try and take advantage of that. The message they copy will be in the seller's own language which makes it easy to trade with people around the world. One of the first items I wanted to buy for my main this league let’s call it “X Y”. Since it was near the start of the league the economy of the game was rather fresh with a lot of demand and not a whole lot of supply. So they were not very cheap to buy. There were only a couple of people selling the item. The interesting thing about this particular sword is there are a bunch of different kinds called Y. Their name is also broke up into two lines one with the first part being X and the second saying Y. They also have the same graphic as all other others. Most just check the name of the item since rare items will roll with a different name depending on the exact stats. Well, this sword is unique and they don’t roll different names depending on the stats since they have a predefined range. More times than not you are used to trading in rare items and not unique rarity. I found a listing and I contact the guy about buying an X Y. I get invited to a party and go out to his hideout and open trade. I put in quite lot money at the time and he puts up Y for trade. I read the last line of the name and look at the item’s graphic. All looks good but I want to make sure I’m getting the stat rolls I’m paying for (another way people try and scam.) Shocker, none of the stats that should have been on the item where there. I go and read the full name and it’s a sword worth 1/180th of what I’m trying to buy in value. I gave the person the benefit of the doubt maybe he pulled the wrong sword out of his tab to trade. So I cancel the trade and tell the guy. He says nothing and does not try and trade again. A few minutes later he invites another person into the group. I can only assume he was a bot at this point. The other guy was looking to buy the same sword! In cases like this due diligence can pay off big time. Who knows how many people fell for that guy's scam before he got an account ban. I can only hope they found whatever his main account was as well and got that as well. While I can understand wanting to play an alter ego in a video game. It makes me wonder how true to life some people’s alter egos are. Games like Eve Online can be great fun because it’s expected that people are going to try and scam you. The lengths some try pulling even more so in games with a tightknit community can be downright crazy. The content was written by @Enjar.